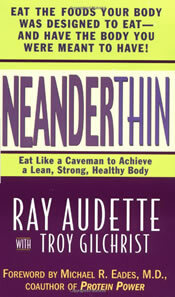 Neanderthin: Eat Like a Caveman to Achieve a Lean, Strong, Healthy Body is a book written by Ray Audette . The author suffered from diabetes (at age 33), and had endured a battle with rheumatoid arthritis for 12 years. His research led him to Paleolithic nutrition – natural diet based on what Stone Age people ate prior to the development of agrarian societies. The simple explanation of the diet, is that only food which is edible in its raw state AND which was available in the Paleolithic age should be eaten. There is no need to refrain from cooking or other forms of food-preparation when following the Neanderthin Plan. Neanderthin has been called a low-carb diet by some. Grains (oats, barley, wheat, rye, etc) are completely out – as are all refined carbohydrates and sugars. This is a big list of ‘forbidden’ food and includes breads, pasta, rice, and even beans. Dairy is also not allowed (obviously a product of agricultural society). Fruit and vegetables are allowed, along with honey (in small amounts). It is essentially a similar diet to what the hunter-gatherer would eat. Nuts, eggs, fish, and seafood, along with a high amount of meat. Obviously the meat must be cooked for health purposes. There is no calorie counting or portion control here – you eat until satiation. Look for some tasty high protein recipes here. There has been considerable amount of research and study into eating habits in relation to disease. History shows an interesting record of this, and many conclusions have been drawn. The success of the Neanderthin diet, and other Paleo-diets may have more to do with removing refined foods from the diet – rather than a premise of “eating what the caveman ate”. There are a number of idiosyncrasies in Neanderthin – such as forbidding peanuts – which completely qualify as a raw food. The sad thing is, is that in modern society healthy (fruits and vegetables) are so expensive compared to their processed counterparts. Nutritionally-challenged breads are so cheap to buy that it’s no surprise that it is a staple of our modern diet. PaleoFood – Extensive collection of recipes. www.neanderthin.com – Official site of the Neanderthin diet. Since quitting smoking 6 months ago i have steadily gained 7 kilos and have been banging my head against the wall trying to lose this weight Despite a seemingly healthy balanced diet and regular exercise nothing was working! Thanks to my chiropractor who introduced me to this way of eating the weight is coming off effortlessly and i cant remember feeling better! my skin looks amazing and my energy levels are soaring. Do you guys do organ meats?? Do you bother with the pemican?? Can this be made safely/easily?? I’ve never felt better than when I’m on the Neanderthin diet. I have more energy, my skin and teeth are better, and I just plain feel healthy. It’s also the only diet that makes sense to me. No processed foods, no manufactured “foods.” I highly recommend reading the book! I regards to why we can’t eat beans, it is because in their raw state, they are toxic and will cause a number gastro-intestinal illnesses when eaten raw. Though cooking removes most of these, a small amount remains and is considered best to avoid them. Neanderthin is working for me. In a month I’ve lost 15 lbs. Considering that prior to starting Neanderthin, I was running 15-20 miles a week and eating low calorie and not losing, this is a huge success. I won’t ever do any other diet again and since reading the book, I’ve done a lot of research on Paleo-type lifestyles and it makes a lot of sense. Regarding Sebastian’s comment about it being more balanced, I totally agree. I have tried Atkins several times over the past few years and I could never stick to it for longer than a few days, so even though there are some similarities, this is different. I agree with Julia’s comment about Canola oil. I only do lard and sometimes butter. I don’t do any oils at all. Regarding the raw meat, I would have to disagree.. our modern factory farms don’t make for the healthiest animals. We really need to cook them to make them safer. Ideally, we would only do grass fed animals.. but they are so expensive. A great plan apart from the author recommending that we avoid saturated animal fats and eat Canola. Hardly a caveman dietary item. And why cook the meat, raw meat is easily digested and if handled properly perfectly safe. The paleolithic diet seems like a more balanced version of a low carb diet which is the only diet that works for me. I might have to give it a try.